Hello friends.. I am back with a card using Julee's latest Mojo Monday #160. 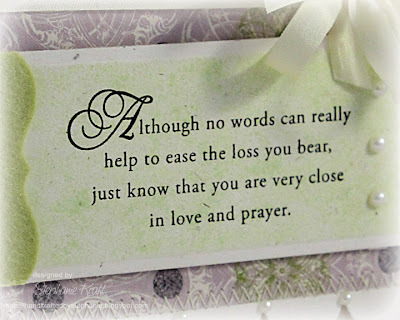 It is with a heavy heart that I sat down to make this sympathy card and finally to write up this post. 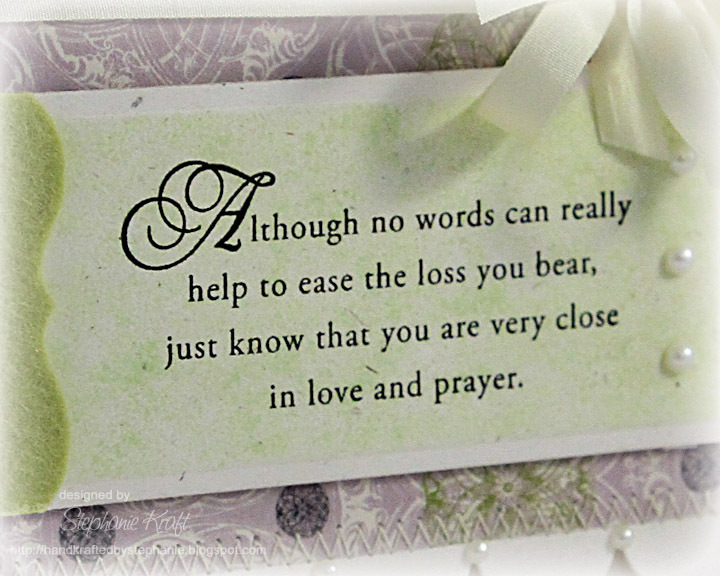 A friend of mine just tragically lost her 5-year-old son, and this is the card that I made for her. I am deeply saddened for the family's loss. They are all in our thoughts and prayers. I pulled out an older Papertrey Ink set that I had not inked up yet, With Sympathy. I stamped the sentiment, cut it out with a Spellbinders Long Rectangle Nestability die, then I added some light sponging while it was still in the die. The small partial frame on the left side is cut out of Simply Chartreuse felt with the Mat Stack 4 die. 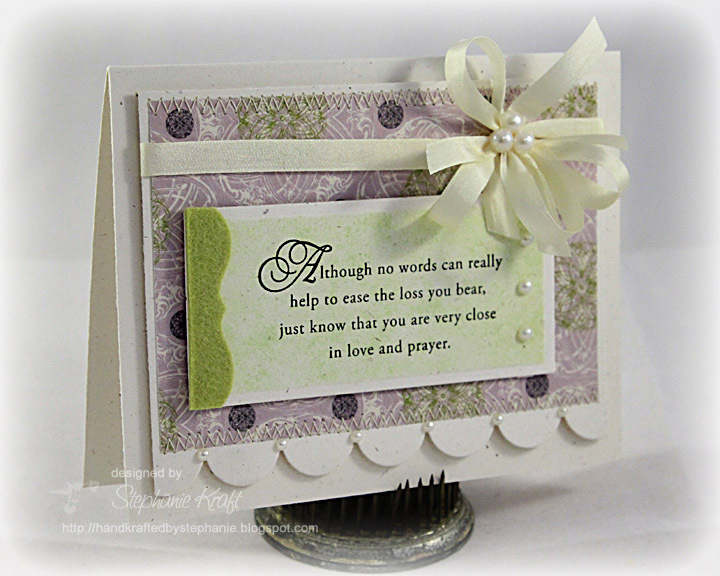 I added some silk ribbon, stitching and ivory pearls from Pizzazz Aplenty. Thanks so much for stopping by. I hope you are having a wonderful weekend and make sure to give your loved ones some extra hugs.. I know that I will. Accessories: Long Rectangle Nestabilities (Spellbinders), Mat Stack 4 die, Medium Scalloped Border die, Simply Chartreuse felt (Papertrey Ink); 3 and 4 mm ivory pearls (Pizazz Aplenty), Large pearls (Queen & Co), Silk ribbon (May Arts), Foam tape, Thread, Sewing machine. Oh my goodness, Stephanie, what a beautiful card. The sentiment is lovely. How tragic it must be to lose a child, especially one this young. I'll remember this family in my prayers, and pray that the Lord will give them the strength to get through this difficult time. Such a pretty and elegant card. WOW Stephanie! Such an elegant card! You surely showcase those Verve stamps like no other! Oh my goodness. That is horrible. I can't imagine losing my son. This is a very sweet card that is sure to brighten her day as much as possible. You are a very sweet friend. Definitely extra snuggles for my guys tonight. Beautiful card. I am so sorry for your friend. Prayers and hugs to you and them.